Wood features in a home’s landscaping are beautiful and will always remain in style. However, wood is easily damaged and, when left untreated, can result in costly repairs and replacements. There are many things that can cause damage and degradation to wooden features and that is why it is important you consistently maintain it with thorough cleanings, sealants, and re-surfacing. Pressure washing is the most effective way to safely clean and restore wood features back to its former glory. Especially with winter on its way, Michigan home owners are preparing their landscaping and hardscaping features for the cold Michigan weather to come. Winter allows for any stains, mold, fungus and dead matter to adhere to a surface and become very difficult to remove next season. It is important to address your wood features before winter arrives, and clean them of any material that may degrade them throughout the cold season. Leaves and plant matter can become permanent if left during winter. Autumn is the time for leaves changing into beautiful colors and covering the ground with a blanket of hues. However, many of those leaves fall onto your wood features, like decks and patios, leaving decaying matter to rot. This dead plant matter can lead to mold formation and the creation of fungus, which can eat away at other natural materials like wood. Fungus attracts pests and disease that can lead to permanent damage of these structures. This fall cleanup, be sure your wooden patio and deck is free from all plant matter before winter arrives with the services of a Michigan pressure washing company. Water stains absorb into wood if left untreated. The stains from moisture sitting on top your wooden structures, and allowed to seep inwards, can leave behind ugly spots and marks that can become permanent features if left unattended. A professional pressure washer can remove water stains before they set in, leaving behind a clean surface that is prepared for the harsh Michigan weather and freezing temperatures. Moisture can build up during winter and inflict structural damage. Moisture is wood’s worst enemy and can not only alter its surface appearance, but also affect its strength and structural standing. Moisture build-up can be removed and cleaned through professional pressure washing which will thoroughly remove any moisture that may seep into a wood’s surface over time, compromising its safety and usability. Pressure washing first removes all dirt and grime from wood, leaving it totally clean for the application of another layer of sealant. Sealant can only be applied if the wood is completely clean, and it is crucial to the future of the wood structure throughout the cold, wet winter season. 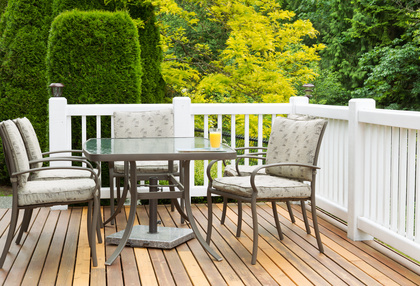 Wooden hardscaping like decks and patios are finicky structures that can easily invite degradation from pests, moisture, and decaying matter. In order to ensure your hardscaping investments remain safe, strong, and attractive, consider hiring a Michigan pressure washing company to revive your wood and confirm its standing next season. Contact Kwik-Klean for a free estimate to get your wood deck pressure washed before Michigan’s winter arrives. We are a Michigan pressure washing company and have been pressure washing wood decks for over 25 years. Kwik-Klean, Inc. is a family owned and operated, pressure washing company that has been proudly servicing the Metro-Detroit area since 1990. Kwik-Klean Inc. takes pride in providing quality workmanship using the finest environmentally friendly products at affordable prices. Kwik-Klean, Inc. is fully insured, provides free estimates and is dedicated to providing customer satisfaction. Is Pressure Washing Siding a Good Idea?